The Malampaya Foundation, Inc. (MFI) recently donated P1 million to GMA Kapuso Foundation (GMAKF), the socio-civic arm of broadcast company GMA Network, Inc., to fund the latter's relief operations efforts during the aftermath of the monsoon rains. 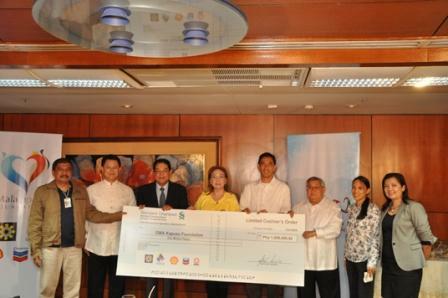 MFI also donated the same amount to the Foundation for the victims of typhoon Sendong last year. Photo shows Ronald Bustos (Malampaya Foundation Inc. Finance and Administrative Manager), Jeng Pascual (Shell Philippines Exploration BV Finance Director), Gilberto R. Duavit, Jr. (GMA Network President and COO), Mel C. Tiangco (GMAKF EVP and COO), Sabino Santos (Chevron Malampaya LLC Asset Manager), Felipe L. Gozon (GMA Chairman and CEO), Karen Agabin (Malampaya Foundation Inc. Executive Director), at Gigie Rebulanan (Chevron Communications Specialist). The Foundation through its Operation Bayanihan program has so far served 218,272 individuals (54,568 families) from different barangays in Quezon City, Marikina, Pasig, Manila, Valenzuela, Malabon, Muntinlupa, Rizal, Laguna, Bulacan, Bataan, Zambales, Pampanga, Dagupan, and La Union. It has collected a total of P 16,708,722.90 worth of cash donations, and P 4,613,989.79 worth of in kind donations as of August 16, Thursday.